TPU reports HIS introduced the Radeon HD 6870 IceQ 1GB edition. This model has the reference clockspeeds, it has a 900MHz core and 1GB GDDR5 clocked at 4200MHz. The cooling solution consists of a large heatsink with four copper heatpipes, the fan looks rather tiny but according to HIS it keeps the card up to 24° cooler at noise levels up to 10dB lower than the AMD reference cooler. Perhaps the idea here is to let users take advantage of the cooler and overclock the card themselves. The HD 6870 packs 1120 VLIW5 stream processors, and is DirectX 11 compliant. The card draws power from two 6-pin PCIe power connectors. Display outputs include two DVI, one HDMI 1.4, and two mini-DisplayPort 1.2 connectors. There is a single CrossFire connector, that allows you to pair with any other HD 6800 series graphics card. 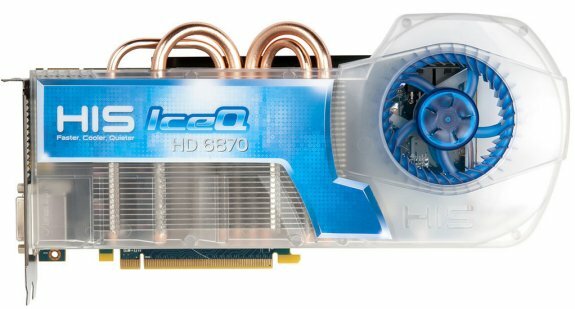 Expect the HIS HD 6870 IceQ to charge a small premium over the reference base model graphics card.